For Sale: Bug buster hatch/companionway insect screens. Bug buster hatch/companionway insect screens. I have three bug buster screens in excellent condition. One is a companionway screen, measuring 36" x 72". The other two are 25" x 25" hatch screens I used on bomar hatches on my Pacific Seacraft. They are barely used and in original cases. Effective against no see-ums. These are pricey new; very well made with lead weights sewn in edges for ballast and UV resistant materials. The hatch screens are $60 each. $190 for all three, plus shipping from western NC. No UV damage -- or any damage -- they're really in great shape. Re: Bug buster hatch/companionway insect screens. That's who I referenced when I priced it and I either mis read the price or they changed it since I checked it. I was pretty careful when I looked so they may have changed it. I'll change the price to make it competitive with new. These might as well be new and will be priced $15-20 below retail so someone can save a few $. If nobody is interested I'll just put em on eBay and see what happens. Anyway, thanks, no bubble bursted here, I fully expect people to do what I do and what you did and make offers based on the market. Forgot this site does not allow for editing. 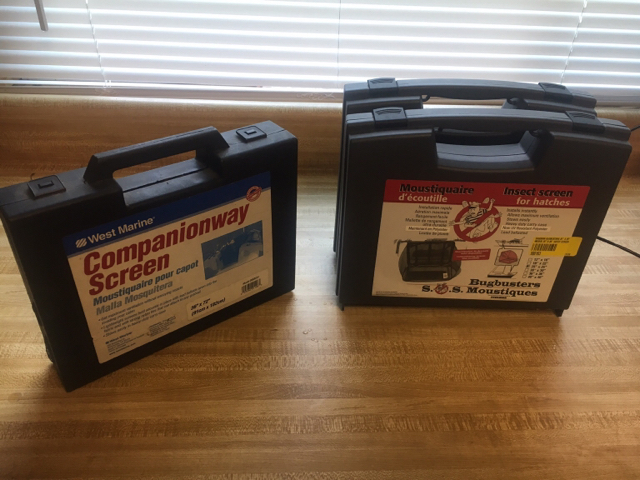 Companionway screen reduced to $60 and others are $55.